GaluhWeb Review 2019: Is GaluhWeb a Good Hosting? GaluhWeb is an Indonesian web hosting company that started operations in 2004. The company offers low-cost web hosting, VPS, dedicated servers, reseller packages, domain registration, and web design services. It serves hundreds of international and local clients from two data centers in the U.S. and Indonesia with servers in additional locations as well. Founded in 2004, GaluhWeb is an Indonesia-based web hosting service that provides shared hosting, domain registration, VPS, mail hosting, and dedicated servers along with web design solutions. Its portfolio consists of thousands of websites and domains managed by a competent local staff and hosted in a local data center and U.S. based facility. The company’s website is in Indonesian. GaluhWeb uses powerful Intel Xeon-powered servers at its data centers in the U.S. and Indonesia. Connected to high-speed networks and running on CloudLinux/ CentOS, its servers offer users the speed, security, and reliability they need for their website, blogs, and apps. Customers also have the freedom to choose the location of servers. When it comes to building websites, GaluhWeb gives its customers a number of options besides its premium web design service. Starters can either use the Breezi site builder tool or Softaculous installer to deploy a number of scripts and content management systems including WordPress, Joomla, Drupal, OpenCart, phpBB among others. 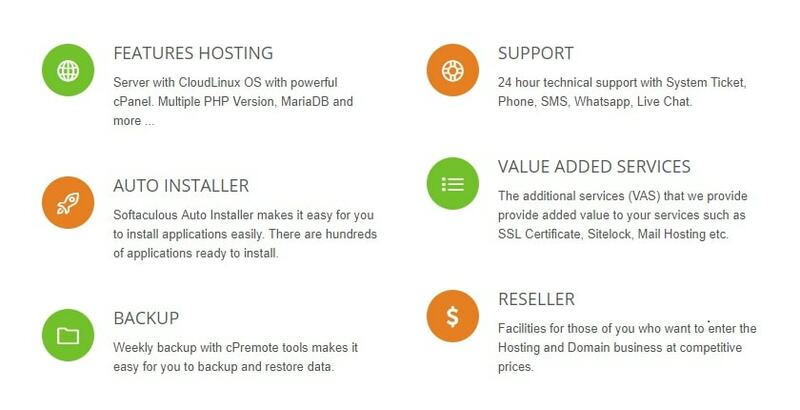 Both come bundled with cPanel and offer various customization options. Galuweb’s partnership with several tech companies means customers get access to some premium quality tools at no extra cost. The Free Attracta SEO tool is useful in improving the rankings of websites while Free CloudFlare CDN integration revs up performance and at the same time boosts website security. SSL is available for those who want to secure their web resources. One feature I found particularly useful is the CPRemote software, which lets customers carry out daily/weekly backups of all their website files and databases remotely. GaluhWeb’s shared hosting, VPS, and dedicated servers are some of the cheapest in Indonesia. The basic packages are designed for personal and small businesses and though they’re available at low prices, they come with decent storage and bandwidth. Moving up, you’ll find Pro packages that come with unmetered bandwidth and varying disk storage space. It’s fast and easy to upgrade from low lever plans to higher ones. If you opt for the one-year plan, you will qualify for a two-month discount. You can place an order and pay through bank transfer, PayPal, or all major cards. Sadly, none of the hosting plans appear to be backed with a money-back guarantee, unlike many Indonesian hosting providers today. Support is available via telephone, SMS, Whatsapp, and live chat. 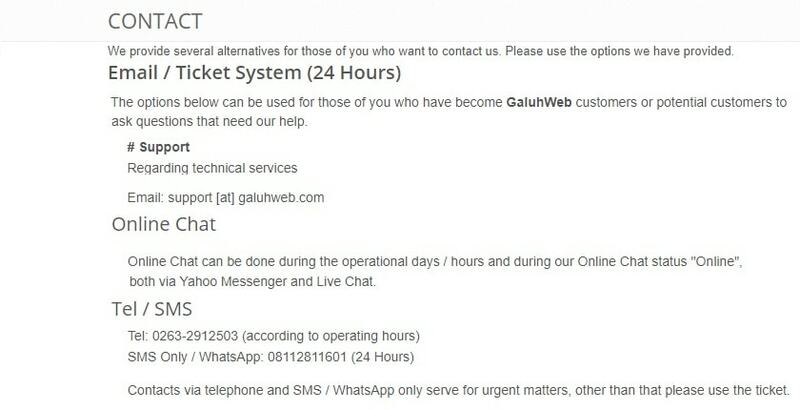 Outside of normal working hours, you can contact GaluhWeb support via email or its online ticketing system. I sent an email but for some reason, the support team didn’t reply. Perhaps because my email was in English, but unfortunately, I can’t be certain. With a number of cheap hosting packages and a friendly local support team, GaluhWeb is a good option for customers who want fast and reliable web hosting services in Indonesia. Wondering how GaluhWeb stacks up against other Web Hosting companies? Enter any other Web Hosting company and we will give you a side-by-side comparison.